The Abundance crystal configuration is most accurately identified as one main crystal with many smaller crystals clustered around the base. Use an Abundance crystal when you want to attract abundance into your life - be it prosperity, happiness or health. Using Feng Shui energy, you may want to place the crystal in the appropriate corner of your Home or office. Activation Crystals, also called Time line or Time Link crystals are identified as being a slightly slanted rectangular shape. If the rectangular face is to the right of the main face, it is called a Right Time Line or Right Time Link crystal and denotes accessing information from the Future. If the rectangular face is to the left of the main face it is called a Left Time Line or Left Time Link crystal and will assist in accessing information from the past. This is a prime example of a Barnacle Crystal. This particular crystal can be recognized by a larger quartz crystal that is covered or partially covered with smaller crystals. These can be randomly attached with no discernible pattern. The larger crystal is the "old soul" which contains the wisdom and trust which attracts the younger crystals. 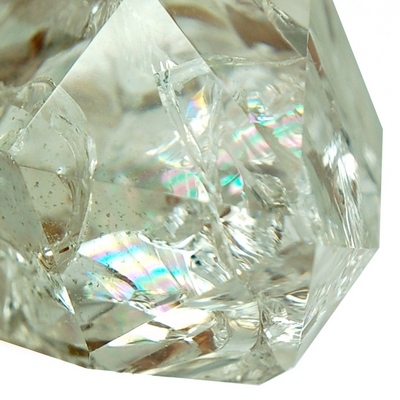 This type of crystal can promote a stimulation of family or group cooperation. It is also used to be a companion when having lost a loved one. 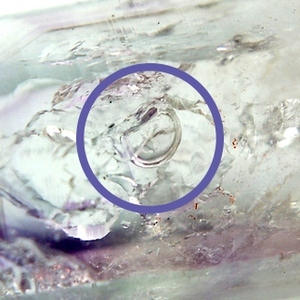 The Bent Crystal occurs when one or more crystals break at some point during the growth process and then later visibly rejoin or heal at an angle. The Bent Crystal can show us that while we may face challenges and "feel" broken, we too, can heal. Bent Crystals signify strength in decision making and confidence in self to face, head on, all that challenges us. There are also natural Curved Crystals, whose growth forms a curve during growth as opposed to Bent which are clearly bent from a fracture and regrowth. A Bridge Crystal is a crystal that connects or bridges two crystals together. Bridge crystals, as the name implies, bridges gaps. Its energy will bring to light that missing piece or connection that you have been seeking to solve a misunderstanding, problem or issue. This crystal forms a bridge to the inner world of higher self and the outer world of the physical/ego. It can also bridge the gap of communication between self and angels/guides. A Burr Crystal is a three dimensional cluster, with the best specimens having crystal points radiating from the center, with virtually no center matrix. A true Burr is very Rare! 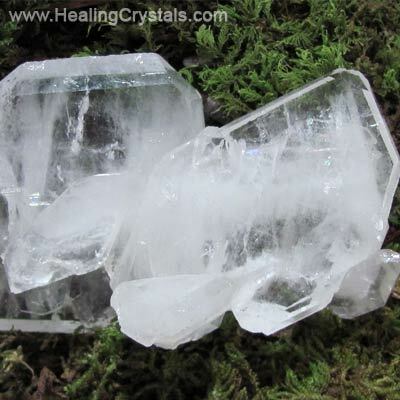 Burr Crystals would make remarkable healing assistants, as the energy from the crystalline formation would send energy out in all directions, similar to a sphere. Place a Burr Crystal in the middle of your grid for radiating energy. 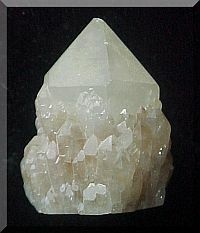 Candle Quartz, also identified as Pineapple Quartz (One prominent point with parallel points stepping up around all sides, similar to candle drippings), is a very calming stone which can be used to eliminate tedium and oppression from one's environment. It also can assist in the realization of damage done consciously or unconsciously to the physical body, so that a solution can be found and put into action. 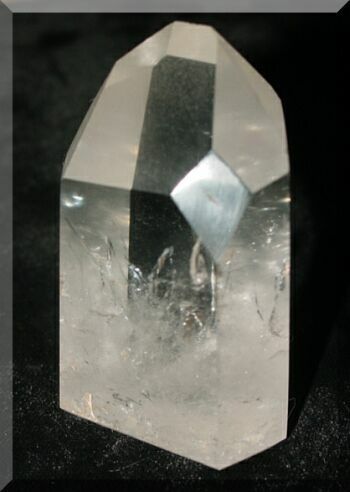 Candle Quartz helps to look inward and discover our truth and our path. A stone of insight sometimes used for scrying, it also dissipates feelings of oppression. 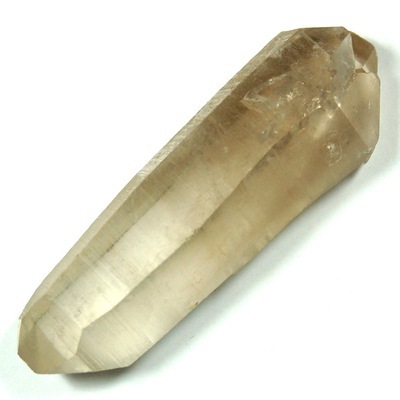 Candle Quartz increases confidence and sensitively while promoting tranquility. Cathedral Quartz, also commonly referred to as a Light Library or Cathedral Lightbrary (Lightbrury), is a crystal that holds a record of all that has occurred on Earth. 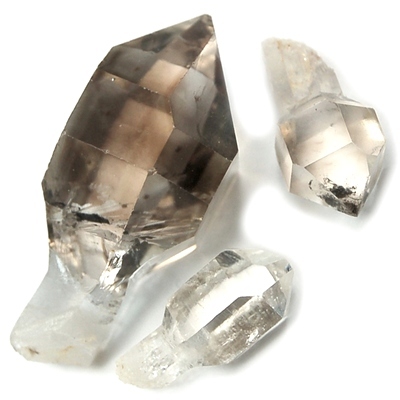 Cathedral Quartz may look to be composed of several or separate pieces, but they are all part of the main crystal. The Light Library can be accessed by meditating with one of these beauties. It aids attunement to the Universal Mind and provides access to the Akashic Records. 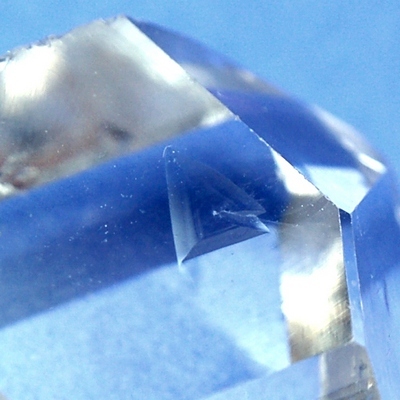 The Channel Face crystal is a point whose main face or facets have seven outside edges. If this crystal also has a triangular face directly opposite of the main face (on the back side) it is called a Channeling Crystal. 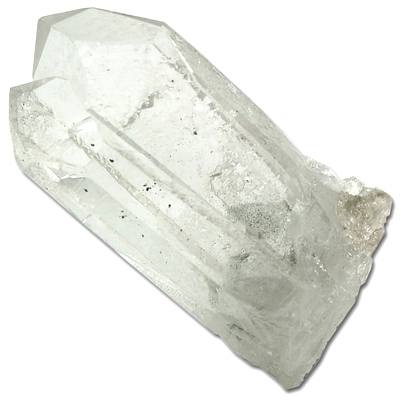 The Channeling crystal allows focus deep within yourself and/or from sources (guides, angels, higher self, etc.) that are outside the "normal" realm. One source of information states that, "each of the seven sides of the main face represents the seven qualities that the human consciousness must attain in order to access and channel the wisdom of the inner soul." 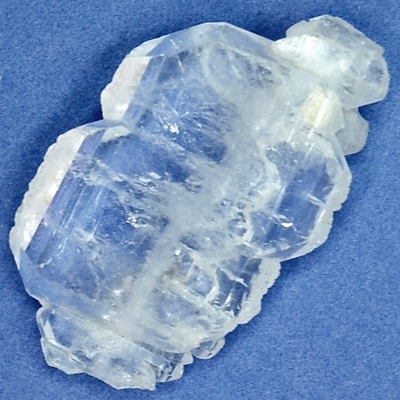 This is an example of a Clear Quartz Cluster. A crystal cluster is defined as three or more crystals with a common base. The crystals may be small or large, or a combination of sizes. 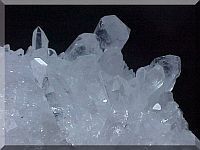 As well as the amplification properties quartz exhibit, this type of cluster will assist in breaking up negativity within an environment and has purification properties. It also is a protector and promotes harmony. The crystal cluster will radiate energy out to the surrounding environment and can also absorb unwanted energy. 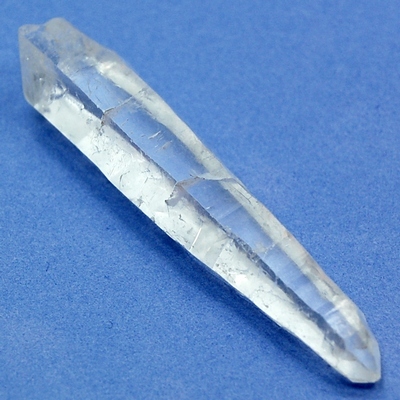 Here is an example of a Diamond Window Quartz Crystal. It can be a four sided vertical Diamond shaped face as one of the main six faces (Rare) or between and slightly lower than the six main faces, making it the Seventh Face (Uncommon). This type of crystal allow us to see the spirit realms and leads us within. It is literally a window to the soul, as it assists us in receiving intuitive answers to questions while bypassing ego and/or intellect. The Diamond faced crystal can assist the balance between the Spiritual world and the material world. It provides a doorway (or window) into other levels of be-ing and a deep connection with Self. A "Dolphin" crystal, also known as a "Mother and Child" crystal is identified as a large crystal with a smaller one closely attached to its "back". This type of crystal configuration promotes nurturing and mothering energies, be it conceiving a child or creating a new project. It is one of the best crystal configurations to assist in gently healing the inner child from past hurts and harms as it allows one to face these issues while feeling safe and secure, bringing back the joy and playfulness of the true child within. 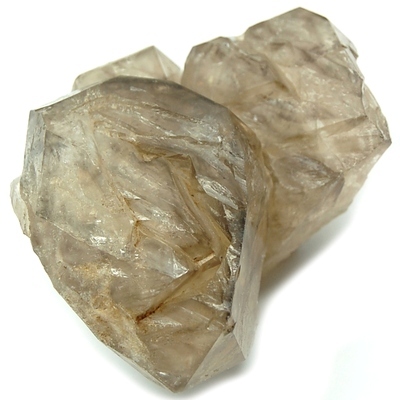 The Dogtooth crystal is a nearly diamond shaped, elongated crystal with two opposing faces and sides. They resemble... well, dog teeth. This configuration occurs after Calcite has eroded due to an over abundance of water current. The rock crystal then forms in its place. Use Dogtoothed Calcite as a meditation stone and focus tool. It allows the holder to go into the piece and marvel at its landscape. Very earthy, very grounding. Dogtoothed Calcite can assist one in facing their fears, acknowledging them and letting them go. Double (Doubly) Terminated crystals are very easy to recognize, as they have points at each end of the naturally formed quartz crystal. Energy may move outward in either direction or in both directions concurrently, which is one reason why it is sought after by healers and light workers. 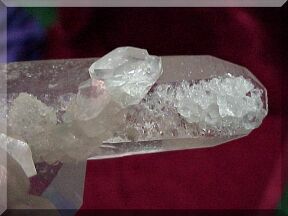 Double (Doubly) terminated crystals can be used for a variety of things including, increasing and intensifying the dream state. Astral Travel and meditation also are assisted by this crystal. 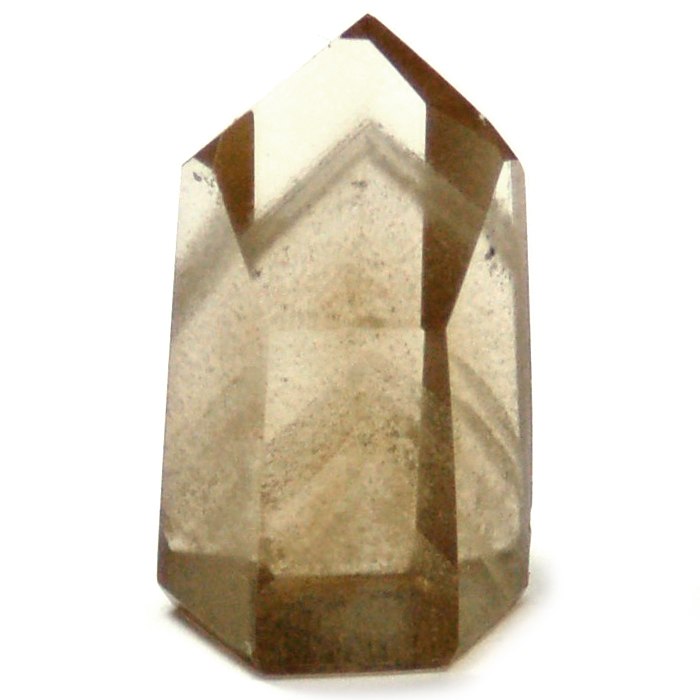 The Elestial crystal has a surface that may show flat to nearly flat point tips, with triangular cut like spaces. This is a powerful crystal, with the belief being that it can repair damaged cells in the brain and rewire damaged areas. The Elestial can be used to assist in the mass cleansing, healing and reawakening that is currently facing us. Elestials are also known to bring great comfort to those in a dying process, assisting in the release of fears. Elestiallated means that portions of the crystal appear to be wrinkled both visually and to the touch. This is what is known as an Enhydro, meaning there is fluid, carbon or gas pocket within the crystal. The fluid can be very old and more than likely very pure. An Enhydro will assist one in recognizing and/or understanding the true feelings of another, supporting the empathetic nature. It contains a life sustaining energy, assisting in healing in many ways. 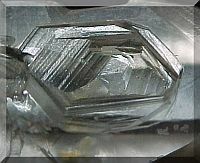 The ET Crystal is identified as a crystal that has a single termination (point) at one end and multiple terminations growing downward at the other, which may appear to look like the tail on a rocket or comet. ET Crystals can be used to enhance the vibrations of energy so that communication with celestial beings, Guardian Angels and Extraterrestrial beings. Faden Crystals (aka Faden Growth or Faden Veil) are identified by the veiled milky feather like line within the structure which usually runs through the crystal. This linear veil is found almost exclusively in Tabular Crystals. The line represents the seed point of growth and these particular crystals have the ability to activate new growth within oneself or within someone you may be working with, utilizing healing energy. Faden Crystals are also a great companion if you are trying to contact or communicate with your twin flame. This is also a wonderful example of Tabular or "Tabby" crystal. 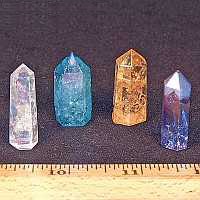 A Generator Crystal (also known by the name Merlin Crystal) is a crystal with six evenly spaced sides and six approximately equal faces that center at the tip. This is called a Generator Point. This configuration amplifies, stores, transmits and/or generates energy. Generators are a great tool to use in any healing modality. They also work very well in a group setting. Generators will energetically help to create a connection between the members of the group, uniting the intention and focus. A crystal generator would make an excellent centerpiece to any grid as well. It will function as an antennae of sorts, amplifying the energy of the crystal grid and transmitting it out into a sacred space, altar area or healing room. A Golden Healer is a crystal or crystal cluster with an iron coating on, or under, the skin. Colors vary from pale, clear yellow to dark mustards and light reds. It has an almost greasy type, transparent coating. The color will not be affected by an acid bath. Golden Healers can facilitate spiritual communications over a long distance, including between worlds and dimensions. 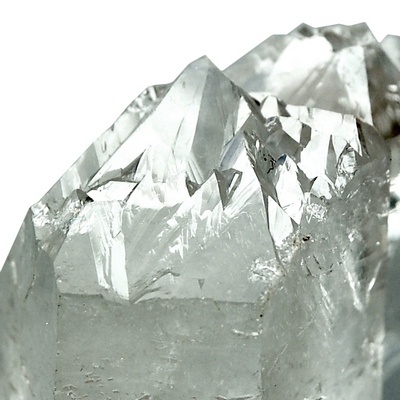 It is a powerful healing crystal, assisting at all levels. A Growth Crater is a four to six sided impression left on the host crystal by the base of another crystal which has since been separated. Growth Crater crystals signify a point of origin, of beginning, a place of safety and security. As we grow and become stronger in self empowerment and self realization, we expand our consciousness and no longer need the safety of the "nest". We then separate ourselves from Home base and fly freely. Work with a Growth Crater crystal when you want to access past life information/beginnings. Also very helpful for understanding when or where in your life a particular habit or emotional state may have begun. Inner Child or Penetrator Crystals are those smaller, fully formed crystals that are half in and half out of the main crystal. This type of crystal will assist in communications, teaching, and a clear understanding between self and another. These crystals allow the holder to balance between the inner world and outer, receiving information from one (inner) and sharing it with the other (outer). It also reminds me of our sweet, innocent, inner child, wrapped closely within the arms of the mother (main crystal) while peeking its head out to face a particular issue and being able to heal that issue in a safe emotional environment. Many crystals have Internal Fractures which are caused by pressure and other elements while the crystal is in various stages of growth. While at first one may perceive this type of crystal to be "imperfect", these beauties remind us that in the physical state of being, we too, may be perceived in the same way. But when working with a crystal which contains internal fractures, the realization that we are perfect and complete just the way we are, embraces us. Our nature is Divine. Many times you will see rainbows appear where an internal fracture is present. What better way to validate our Divine nature than the rainbow? This is an excellent example of an Interrupted or Growth Interference crystal. 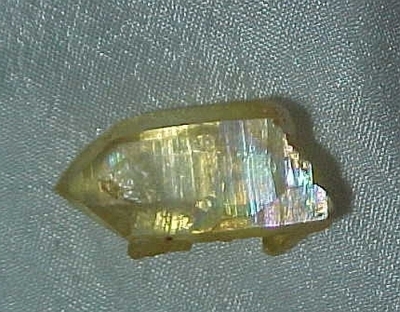 As shown, this type of crystal has various "cuts" on the body, similar to cuts done with a trim saw. Thin, minute, flat calcite crystals have interfered with the growth pattern of the quartz crystal. This type of crystal formation is believed to help remove self limitations and energy blockages. 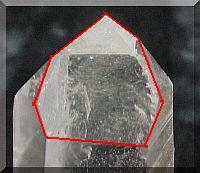 A crystal with a five sided face (normally as the front or main face) is identified as an Isis Crystal. This crystal holds feminine/Goddess energies and can be used by both men and women when wanting to access the more feminine side of self. Isis crystals are a wonderful tool to utilize when you are in the process of taking your power back from someone or something that has in the past taken your power from you. The Isis crystal will assist you in becoming more aware of and understanding of the role the feminine plays for each of us. The Laser Wand may appear to be three sided at first glance. It will gradually decrease in size from the base to the tip. Laser Wands "can be used to help heal relationships by cutting the emotional cords of jealousy, insecurity, anger, sorrow or guilt. They can also be used to assist in breaking attachments towards people or things. When these cords are cut, one must rebuild the identity based in self love and security." 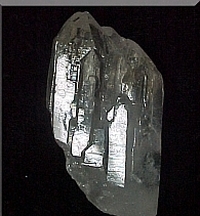 A Manifestor is characterized by a crystal growing totally inside another crystal. Manifestation crystals help those who have had traumatic, physical or emotional, childhood. Manifestation Crystals are helpful for those who block painful memories. They help bring the cause of the pain to the surface allowing one to successfully deal with it, while shielding from the pain those memories can cause. Manifestors can also assist those who are working through current family problems or issues. Very helpful in assisting with manifestations of any kind. If there is something wished for by using manifestation techniques, some questions may be, "Do I really want this?" or "Are there reasons I may not want this?" Be very clear! If the crystal perceives mixed messages, it may not facilitate the manifestation. The Occluded crystal is a type of formation which proceeded in spite of an overabundance of other materials, resulting in a crystal which may appear to be made entirely of something else. This can happen particularly with chlorite and /or sand. The crystal at left appears to be made up of sandstone and other silicas, but look closely and you can see a crystal growth formation hidden away. This crystal reminds us that everything is not always as it appears to be at first glance. Use this crystal when you are working on being less judgmental of yourself and others. This is definitely a piece to use when working on issues of self esteem and self empowerment. 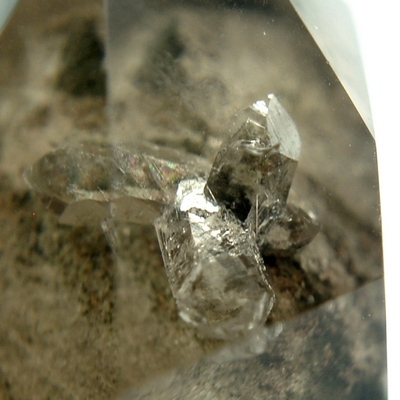 A Phantom crystal is recognizable by a "phantom" or "ghost" crystal within the main crystal, usually comprised of a white or colored mineral being partial or complete. 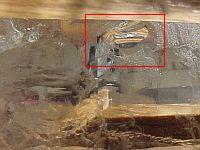 The Phantom can appear as an outline (ghost) or solid body within the host crystal. The Phantom crystal symbolizes universal awareness. The energy of the Phantom works to bring together the participants of humanity to save the planet. It is also an excellent tool for meditation and for assisting in the connection with the higher realms, ESP those of knowledge. Phantom Crystals may also aid one in meeting a personal guide. Phantoms promote inner growth and transcendence. A great crystal for "gazing" as well. One of my favorite things to look for in any crystal is the presence of "rainbows". Rainbows occur when there is a break or fracture within the crystal, causing certain prismatic effects. The presence of a rainbow gives additional energies which otherwise may be lacking in a clearer specimen. Rainbows stimulate the awareness of Universal Love. They can assist in drawing off unwanted energies and dispersing healing to the body and/or the environment. Many feel that the Rainbow assists in connection with the Higher Self, Guides, Angels, and a host of teachers/information. A Record Keeper has triangular shaped symbol(s) which can be raised or engraved on one or more of the crystal's faces. These are not easy symbols to see with a one time glance - they must be held to the light and looked at closely. Record Keepers are one of the most sacred of all crystals because they hold the knowledge of the Universe. The ancient Atlantians programmed the Record Keepers before the fall of that great civilization in order to record and safeguard their knowledge. When one is properly attuned to this crystal, this ancient knowledge may reveal itself. One must be of pure heart and open mind to access the secrets of the Record Keeper. 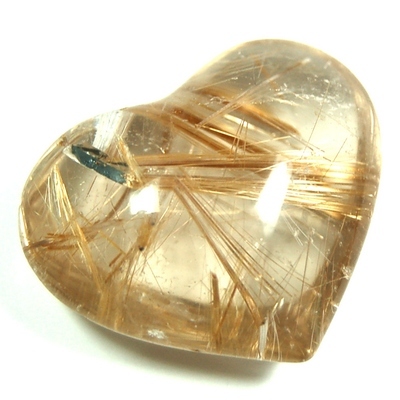 Rutile in Quartz or Rutilated Quartz is easily recognized by the "needles" (usually formed from Titanium Dioxide) encased in the crystal. The Rutilated crystal draws universal life force energies into the body, is a regenerator and enhances energy in other stones. Rutilated Quartz also promotes self-determination,self-control, strength of will, resolve, self-reliance, volition, steadfastness. Good for people who have trouble making decisions Also associated with happiness, communication with spirit guardians and general healing. Rutilated Quartz gets to the root of problems and fast! Aids astral travel and absorbs mercury poisoning. 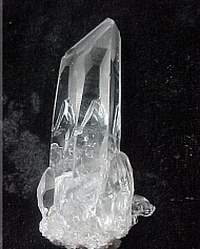 This natural formation of a quartz crystal is called a Scepter Crystal. This formation is recognized by the natural crystal forming itself around a crystal "rod" hence, the appearance of the Scepter. The top part of the Scepter should have six edges visible where the rod and crystal meet. This is known to be a symbol of power and focuses energy within the heart. These crystals were used in Atlantis and Lemuria in healing ceremonies. Self Healed crystals are identified as a partial or whole crystal that has been severed from its original matrix or cluster. Some time later, conditions once again become perfect for growth and a new crystal structure begins to grow over the area that was severed. In effect, the crystal heals its own wounds. As its name suggests, the Self Healed crystal is here to assist and aid in self healing - be it physical, emotional, mental or spiritual. It is able to send supportive energies to those who have had severe emotional, physical or mental traumas. A wonderful piece to use when facing addictions. Tabular or"Tabby" crystals are recognized from the flattened or tabbed shape with "notches" on one or both sides. The two opposite sides are twice as wide as the others. Rubbing one's fingernail downward, across the notches, will "open" the crystal and its information. Tabular Crystals enhance communication and smooth energy flow and balance. 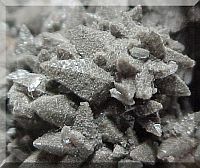 Tabular Crystals (Tabbies) can also assist in communications with nature and spirit beings. 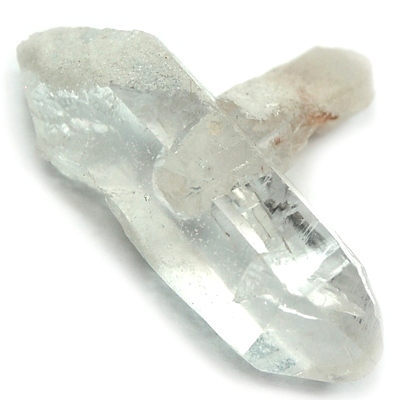 The Twin Quartz Crystal, also known as the Soul Mate Crystal or Tantric Twin can be recognized by two points that share a single base or two points sharing a common side. The Twin does not need to mirror in height or faces. These crystals promote loving contact, tender communication and togetherness. Twins teach us to blend with all life and realize that our soul is wed to all beings. This particular crystal is doubly fascinating as it has two smaller crystals protruding from the twins. These protrusions are called Inner Child crystals or Penetrators. There is one in each of the twins. If you'd like to learn about MORE formations, grab our Crystal Formations eBook which is jam-packed with 36 natural and 19 cut-and-polished formations.